Let the darkness descends this Halloween! Disco Donnie Presents and React Presents, two of the biggest and most notable names in electronic dance music, just announced Freaky Deaky Texas for their inaugural Halloween weekend in Houston, Texas. 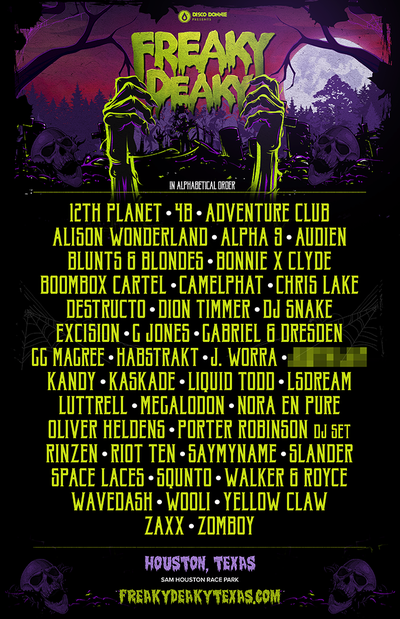 Freaky Deaky will be creating a haunting celebration with 12th Planet, Bonnie x Clyde, Chris Lake, Destructo, Gabriel & Dresden, J. Worra, Liquid Todd, Walker & Royce, Yellow Claw, and Zomboy are just a few of the standout names that are joining top headliners including Excision, Destructo, Kaskade, DJ Snake, and Porter Robinson. Previous articleAmsterdam Dance Event announces first confirmed artists! Next articleBooks that Rave: Exclusive Interview with Author Diana Forbes.